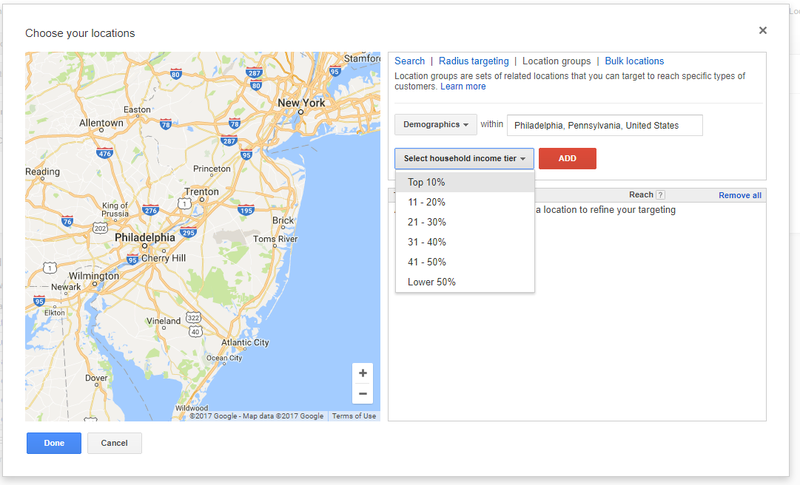 With the introduction of the new AdWords interface, Google will be moving the option to target specific household income groups from location targeting to the Demographics tab. Within the old AdWords interface, income targeting was restricted to the location targeting options, which means that selecting an income tier was based on guesswork. Advertisers would select the group that they figured most closely matched their target demographic and simply hoped that it would work. Household income options are now available in search, display and video campaigns within the Demographics section of the new interface, along with age, gender and parental status. You can still choose from the same income tiers as before, but now you’ll also see an “Unknown” segment. This segment includes users whose age, gender, household income or parental status hasn’t been identified by Google. This means that you’ll have the ability to target users who may not have been classified into a specific income tier, which was not possible when household income was within the old location targeting options. As the notification in AdWords states, the existing targeting criteria will be automatically removed, as well as any applied bid adjustments. This may cause some campaigns to be paused if advertisers don’t make the appropriate changes in time. When asked when these changes might take place, Google informed us that they’ll start rolling out the update on October 12, 2017. To avoid any issues with the performance of their campaigns, advertisers should begin transitioning any of those that are currently using this targeting type to the options in the new AdWords interface. Adding this feature to the Demographics page means that advertisers can gain more insight into the household income of their targeted audience, even for campaigns without specific income targeting. By analyzing this data, advertisers can gain a better understanding of their ideal audience and make more informed decisions when figuring out which income levels provide the highest return on investment. Interested in pay per click services? Look no further than 1SEO.com Digital Agency, a leading PPC agency in the Philadelphia and New Jersey area.